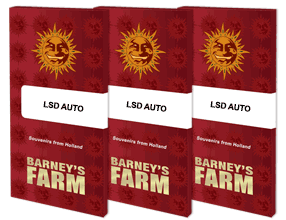 We are over the moon to be able to announce the arrival of our LSD AUTO™. A crossing of our legendary LSD with our monster autoflowering lineage. Like her legendary predecessor LSD AUTO™ really packs a punch and will quickly send you flying into another dimension with a crackle. LSD AUTO™ comes on fast as right before you reality starts to distort into a pulsing psychedelic painting. This is not a strain to be recommended for beginners. Despite her powerful effect, she’s simple to grow and anybody can take advantage of this super speedy route to some seriously mind bending genetics. Let her pungent power slice through your mind and soul – why don’t you take a trip down LSD avenue with LSD AUTO™.